Mike Sand's older brother, John Peter Sand, had a colorful life to say the least. Born in Luxembourg three days after his parents' wedding, he crossed an ocean when he was 10 (with his parents and 3 sibs). 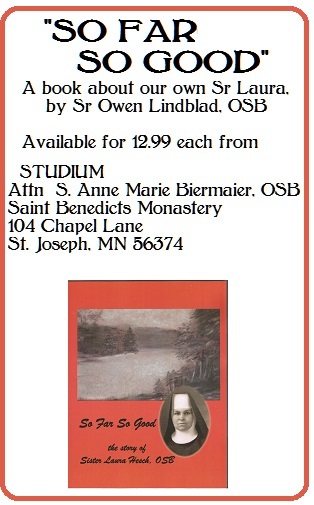 They settled in Iowa long enough for 2 more sibs to be born, and then moved permanently to LeSauk township in Stearns co. Minnesota. John Peter was a kid when the Civil War began, and 16 when he decided to join the army. The war ended soon after, and John Peter came home a veteran. We assume that he became a deputy sheriff in Little Falls because veterans often get govt jobs when they return. Besides, JP bought the gun he used in the war, so he was already armed. Eventually, JP married a woman named Helena, and by the 1875 Minnesota census, they have a son, named Peter (of course), and two other children who aren't mentioned after the 1880 census. Helena died around 1880, because in the 1885 Minnesota census, JP is married to Magdalena (Ferschweiler), and they have Peter (10), Margaret (4) and Frank (4 months). There's lots about JP here on HH so far; if you're interested, there's a search box above the blog title, on the left. What we have in this post are news items from the last 12 years of his life--what happened after Lena released a prisoner (1889) and destroyed both their reputations. Evidently, John continued working for the city as a deputy, and later was a juror and interpreter (at least once). Here's the Little Falls Transcript page of county expenses for 1889 and for 1892. 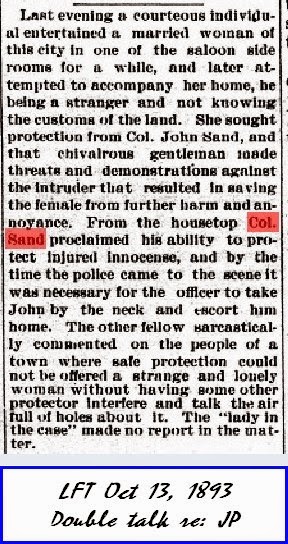 In 1893, the accountant lists money paid to Peter Sand and John P Sand for "street work", and to JP as a juror. 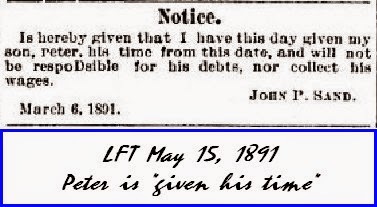 Young Peter would have been 19 then, but earlier, in 1891, two things happened: JP's grandmother, Angelique (Mohimont) Stoltz, back in Luxembourg, died, and young Peter was "given his time", meaning his freedom as an adult, as in the notice below. Why it was dated March but published in May, we don't know. He was 17 in 1891. Evidently, the Little Falls Transcript newspaper had a fairly snarky writer on staff--someone who knew the towns' backstories, you might say. (Apologies for the blur here, but that's the way it was on the Library of Congress site). 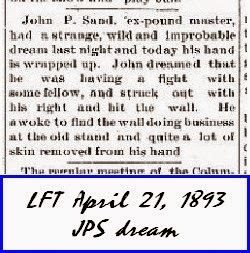 "John P. Sand, ex-pound master, had a strange, wild and improbable dream last night and today his hand is wrapped up. John dreamed that he was having a fight with some fellow, and struck out with his right and hit the wall. He awoke to find the wall doing business at the old stand, and quite a lot of skin removed from his hand". 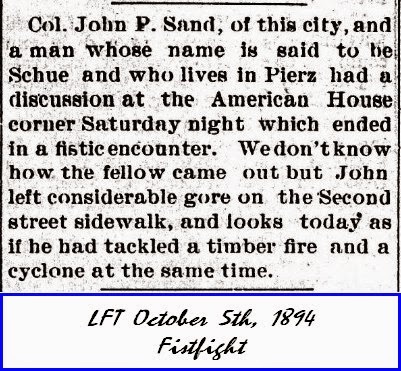 We don't know what an "ex-pound master" was; maybe the 'dream' was just another way of reporting on a local fistfight, but it's not near as snotty as these next two clips from October of 1893 and 1894. 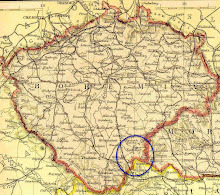 Maybe Little Falls was feeling a bit sore at JP by then, but the allusions in the clip on the left were doubtless well known to local people, while all we can do is speculate. 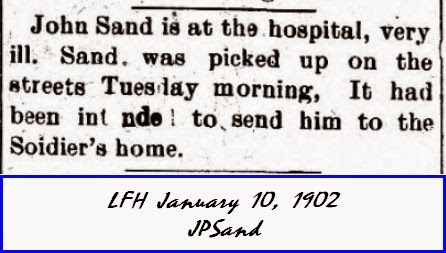 JP's father, Peter Sand Sr, died in late December 1894, and since we don't know about their relationship, it could have affected JP either way. Definitely, JPs road was getting rougher and more full of pitfalls. 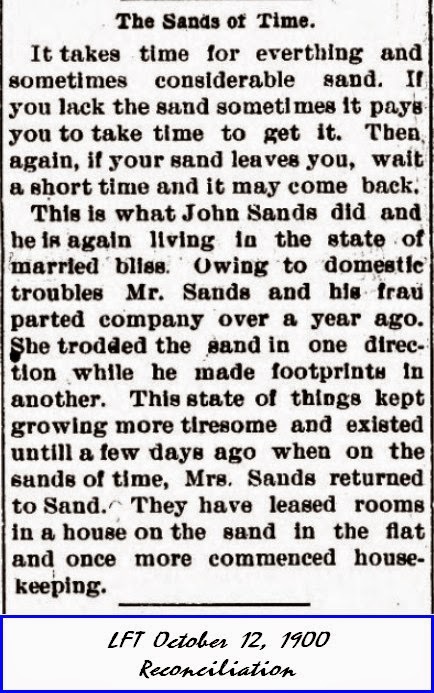 Was this article from 1900 just more snark, or did they actually try to patch things up? In the 1900 census, John listed himself as "divorced", and I think he drank some in his last two years, so this reconciliation didn't last. (Did they really stay married after 1889? Whew). He died at St Gabes in 1902, at 54 years old. What a short, epic life.